My goal with these edits was to create versions of the PT that were to put it simply 'enjoyable to watch'. I wanted to make good versions of these films that still felt like the same films in essence. I've seen other great edits that chop the films down to 90 mins but for me a true SW film should give you around 2 solid hrs of entertainment (And not 2.5hrs either!). Trimming action scenes to increase pace. Reworking all major Lightsaber duels. Evaluating and then editing every line of dialogue that I felt didn't work. Adding a few OT music queues. Adding portions of most but not all deleted scenes back in. Removing over-the-top CGI shots and Digi-Doubles. But most importantly of all I've focused on transforming the characters. In TPM Anakin is brave and an amazing pilot, Padme and The Queen are one character, while Jar-Jar has purpose and is no longer annoying. In AOTC Anakin is now likeable and you believe the romance with Padme. In ROTS needless messing around with R2 is replaced with warm character moments between Anakin and Obi-Wan, while Padme is no longer confined to her apartment, she has a role in the senate, she feeds Anakin's growing unease and she has a part in the seeds of the coming Rebellion. Lastly Anakin is not revealed to be Vader so you can still enjoy ESB. Members of the originaltrilogy.com/forum/ for helping me find out how you get these edits out there! Deleted Material compilations and Extended Alternate Sequences coming soon! I was excited by reading Adywan's plans for the SW:PT trilogy on the Revisited website and knew this would be years in the making. So I decided to try and fix them for myself. I'd seen a VHS rip of The Phantom Edit a decade ago and I'd completed a fan edit of Kill Bill several years ago so I knew it was both possile and fun! Before doing these edits I avoided watching any other versions to keep my mind fresh. After completing these Star Wars edits I've gorged myself on other SW fan edits and they did some stunning work. They tightened up pacing, they swapped scenes, they trimmed repetition but for me they didn't always get to the heart of the problem. I felt the this problem with the PT was "Likeability". If you liked the characters, liked the scenes and liked the dialogue you shouldn't need to chop the films down to 90 mins or less. Because you'll want to spend the full standard SW 2 hours in this world just like the OT. In this edit I've trimmed bad dialogue and acting throughout, recut, condensed or removed scenes, redubbed the Gungans, rewrote all subtitles, inserted the classic Fox and Lucasfilm logo opening, removed the Queen/Padme subplot, made Anikin a courageous hero and made Jar-Jar a Prince. I've also added back all the deleted material (But trimmed that for quality too). I hope this is the first part of a trilogy that people are truly going to ENJOY. - All Jar-Jar/Gungan audio replaced with alternate soundtrack and newly written subtitles. - All references to Anakin crashing his pod, being clumsy or not being a good racer have been removed. - All references to Padme and the Queen being seperate people are removed. - 00.11.04 NEWJJSUB "Oma-Oma save me! - 00.11.07 NEWJJSUB "What... was that?" - 00.11.16 NEWJJSUB "Master Jedi, you..."
- 00.11.17 NEWJJSUB "Hey, wait!" - 00.11.20 NEWJJSUB "I owe you my life"
- 00.11.23 NEWJJSUB "Brainless? I Speak!" - 00.11.28 NEWJJSUB "No no. You saved my life Master Jedi,"
- 00.11.30 NEWJJSUB "I am Prince Jar-Jar Binks,"
- 00.11.32 NEWJJSUB "I always repay a debt"
- 00.11.34 NEWJJSUB "Oh but it is, the Gungan gods demand it!" - 00.11.39 NEWJJSUB "Oh no!" - 00.11.49 NEWJJSUB "You saved me again Master Jedi!" - 00.11.57 NEWJJSUB "More you say!" - 00.11.59 NEWJJSUB "This Droid army came from nowhere." - 00.12.02 NEWJJSUB "I must alert my farther in Otuh Gunga." - 00.12.04 NEWJJSUB "For now, our people should be safe there,"
- 00.12.06 NEWJJSUB "It's a hidden city..."
- 00.12.09 NEWJJSUB "Ah huh." - 00.12.12 NEWJJSUB "Yes, follow me." - 00.12.19 NEWJJSUB "Otuh Gunga is here, under this lake." - 00.12.21 NEWJJSUB "I hope you Jedi can swim!" - 00.12.23 NEWJJSUB "Gungans don't usually permit strangers to enter..."
- 00.12.26 NEWJJSUB "So don't expect a warm welcome!" - 00.12.40 NEWJJSUB "Come, follow me friends." - 00.13.27 NEWJJSUB "Thank Oma-Oma! The city is still safe." - 00.13.36 NEWGUNGANSUB "Outsiders here? Call the guards!" - 00.13.47 NEWCTSUB "My Lord! We'll kill these intruders immediately!" - 00.13.49 NEWJJSUB "No! Captain Tarpals, my friends require transport..."
- 00.13.52 NEWJJSUB "...at once!" - 00.13.53 NEWCTSUB "I apologise Prince Jar-Jar!" - 00.13.54 NEWCTSUB "Guards, what are you waiting for!" - 00.13.55 NEWCTSUB "Prepare a sub without delay!" - 00.14.52 NEWJJSUB "No. the Gungans and Naboo have never got on." - 00.14.54 NEWJJSUB "We nearl came to war, erm..."
- 00.14.57 NEWJJSUB "about a century ago." - 00.15.11 NEWJJSUB "You see, the Naboo are... artists and philosophers,"
- 00.15.15 NEWJJSUB "the Gungans on the other hand... are mighty warriors!" - 00.15.28 NEWJJSUB "An Opee Sea-Killer, we're doomed!" - 00.16.34 NEWJJSUB "Welcome to Theed young Jedi." - 00.19.25 NEWJJSUB "These Jedi sure are powerful warriors!" - 00.26.03 NEWWATSUB "Greetings, come in..."
- 00.26.07 NEWWATSUB "How can I help today?" - 00.26.17 NEWWATSUB "Anakin, quick! There's money to be made." - 00.26.23 NEWWATSUB "Just you be quicker next time!" - 00.26.25 NEWANSUB "I was tuning that new X-34 speeder." - 00.26.27 NEWWATSUB "Yes, yes. Mind the store, I got a deal to make." - 00.28.29 Anakin "Fixing things line" removed as Jar-Jar was ALL OVER IT! - 00.28.38 NEWWATSUB "Huh... outlanders!" - 00.28.41 NEWWATSUB "They're gona need looking after in this place." - 00.28.44 NEWANSUB "I kinda liked 'em." - 00.28.46 NEWWATSUB "Well then... go warn 'em,"
- 00.28.48 NEWWATSUB "a sand storm's coming." - 00.29.23 NEWJJSUB "Oh... those look delicious." - 00.29.27 NEWSUB "Hey, hey. No browsing stranger!" - 00.29.32 NEWSEBSUB "I don't think he likes you very much,"
- 00.29.34 NEWJJSUB "I was only... ahhh!" - 00.29.36 NEWSEBSUB "and I don't like you either." - 00.29.40 NEWANSUB "What's this Sebulba?" - 00.29.42 NEWANSUB "Beating up tourists again?" - 00.29.44 NEWANSUB "It's gotta be easier than beating me on the track." - 00.29.47 NEWSEBSUB "Shame you're not racing tomorrow monkey boy,"
- 00.29.51 NEWSEBSUB "I'd love to run you into a canyon wall.. slave scum!" - 00.29.56 NEWANSUB "You'd have to catch me first!" - 00.30.10 NEWJJSUB "You're sure brave boy,"
- 00.30.13 NEWJJSUB "I'm lucky you came along." - 00.31.05 NEWJJSUB "I'm glad to be outta that storm." - 00.31.17 NEWJJSUB "Ah, this looks tasty!" - 00.33.55 NEWJJSUB "How awful!" - 00.35.24 NEWJJSUB "We don't have anything to trade." - 00.38.13 NEWWATSUB "Your new friend sure likes to take risks, huh." - 00.40.15 NEWSUB "Your gonna need luck Ani!" - 00.45.42 NEWWATSUB "Good luck my boy." - 00.45.45 NEWWATSUB "Better stop your friend's gambling, before I own him too!" - 00.46.30 NEWBESUB "Welcome to the 'Boonta Eve Classic',"
- 00.46.32 NEWBESUB "the highlight in the calender of all Podracers." - 00.46.51 NEWBESUB "Let's run through todays contenders..."
- 00.46.55 NEWBESUB "Gasgano's in his custom Ord Pedrovia." - 00.46.58 NEWBESUB "Beside him, Teemto Pagalies,"
- 00.47.03 NEWBESUB "and of course the Grand-Champion of Pixelito..."
- 00.49.14 NEWSEBSUB "You won't walk away from this one kid,"
- 00.49.17 NEWSEBSUB "I'll make sure of it." - 00.49.19 NEWANSUB "Don't count on it, slime ball." - 00.49.22 NEWSEBSUB "You're gonna be Bantha fodder." - 00.49.52 NEWBESUB "Now entering the arena, the mighty Jabba The Hutt." - 00.50.08 NEWSUB "Welcome podracing fans from across te galaxy." - 00.50.12 NEWSUB "To the racers who survive, we salute you!" - 00.53.27 NEWBESUB "In the lead, Sebulba!" - 00.58.05 NEWJJSUB "What a pilot!" - 00.59.48 NEWSEBSUB "He never gives up!" - 01.01.02 NEWJJSUB "We won Ani!" - 01.01.08 NEWWATSUB "The race musta been fixed!" - 01.01.19 NEWJJSUB "You've saved us Ani!" - 01.03.05 NEWSUB "He must of." - 01.03.22 NEWSUB "One day Greedo, you're gonna pick a fight with the wrong person." - 01.14.02 NEWJJSUB "Now, Queen Padme will get the senate to help us,"
- 01.14.06 NEWJJSUB "I'm sure of it"
- 01.17.02 Qui-Gon line redubbed to "It is possible he was conceived in the force"
- 01.22.13 NEWJJSUB "You're thinking your people are dying?" - 01.22.19 NEWJJSUB "Gungans might be dying too..."
- 01.22.26 NEWJJSUB "Gungan's won't die without a fight... my father,"
- 01.22.30 NEWJJSUB "commands a grand Gungan army." - 01.22.34 NEWJJSUB "Maybe that's why your people distrust us." - 01.27.01 NEWJJSUB "We're going home!" - 01.28.15 NEWJJSUB "You need my help?" - 01.29.37 NEWJJSUB "There were signs of a battle,"
- 01.29.40 NEWJJSUB "and the city is deserted." - 01.29.48 NEWJJSUB "I don't think so,"
- 01.29.50 NEWJJSUB "My father must have led our people to the,"
- 01.29.53 NEWJJSUB "Gungan's sacred refuge deep in the swamps." - 01.29.55 NEWJJSUB "Quick follow me!" - 01.30.15 NEWCTSUB "Sire, your son brings before you, Queen Amidala of the Naboo..."
- 01.30.20 NEWBNSUB "Your capital is overun with this mechanical army,"
- 01.30.23 NEWBNSUB "so what do the mighty Naboo want with us lowly Gungans?" - 01.31.10 NEWBNSUB "I don't think a Naboo Queen has ever nealt before the Gungans!" - 01.31.17 NEWBNSUB "I am quite overwhelmed,"
- 01.31.22 NEWBNSUB "I think the Gungans and the Naboo can be... friends." - 01.32.01 NEWSUB "Here they come." - 01.32.15 NEWBNSUB "I'm very proud my son." - 01.32.18 NEWBNSUB "Jar-Jar, this alliance with the Naboo is thanks to you,"
- 01.32.22 NEWJJSUB "No, no, no..."
- 01.32.23 NEWBNSUB "Yes! You and Tarpals shall be our armies Generals." - 01.33.23 NEWBNSUB "The Gungans do not fear death." - 01.34.55 NEWCTSUB "Start up the shield generators." - 01.37.52 NEWJJSUB "Steady... steady." - 01.38.46 NEWCTSUB "I got a bad feeling about this..."
- 01.43.59 NEWJJSUB "Halt, halt!" - 01.44.07 NEWJJSUB "If I can just release these bombs... ahhh!" - 01.44.17 NEWJJSUB "General Tarpals!" - 01.46.29 NEWCTSUB "This is the end General Jar-Jar,"
- 01.46.32 NEWCTSUB "I hope we bought the Naboo enough time." - 01.48.22 NEWJJSUB "They've all stopped..."
- 01.48.24 NEWCTSUB "The Naboo must of knocked out the control ship... look!" - 01.53.32 NEWJJSUB "Hello everybody!" I think I'm just punishing myself by watching fan edits of the prequels because there is nothing that can be done to make this a good movie. It is irredeemable. Yes the fan editor had a few good ideas, but he should have changed the nemodians voices to and given them subtitles and also the battle droids. I think this is the last time I'll watch movie in any form. From now I'll pretend it doesn't exist. This is an INCREDIBLE fan edit--perhaps the creme-da-la-creme of Phantom Menace edits. It's difficult to pick a clear TPM FE "winner" because each edit has its own intentions and each that I've seen has been skillfully executed and most have achieved their stated goals, but given that my desire in a Phantom Menace movie matches very closely to TM2YC's stated goals, I cannot help but vote this so very highly. - Create a movie that is enjoyable, without moments where you cringe. - Add depth and clarity to the characters. - Keep the length up--a Hollywood movie should be 1.5 - 2 hours long. All of these goals were achieved, admirably. The Portuguese soundtrack was used to obscure bad dialog, and the associated subtitling allowed the movie to go "off script" where needed to clean up a lot of problems and add interest and depth to the characters. A lot of deleted scenes were introduced and the quality of the upconversion is astounding. Some of the edits (trims, cuts, transitions) are amazing. There is an edit during the Gungan / Droid fight that is so seamless, and so craftily fixes a certain unbearable issue in the original movie, that I was floored at the solution that TM2YC employed. I watched the entire movie and actually forgot what a train wreck the original was...I was pulled into the movie and found myself enjoying it. If I had to create a time capsule for future generations, this edit of the Phantom Menace is the one I'd probably drop in. No review is complete without attempting to lend some critique to the FE. This is quite difficult, in this case, but I'll try and mention a few things so as to have performed my duty in providing feedback to the editor. - Portuguese works really well...unless you're a Portuguese. But that's an intrinsic problem with the use-an-alternate-soundtrack approach to "alien-izing" and subtitling the CGI characters. - I think, perhaps, the pod race may have been a minute or two longer than I prefer. It's a great bit of movie-making--probably Lucas' showpiece of the movie--but there's a "diminishing returns" aspect of having the pod race go on for so long. Maybe the deleted scenes could have been trimmed a tad. - Of course their will /always/ be differences in opinion with regards to where exactly to cut and splice. During the course of watching this FE, there were a handful of moments where I thought that I would have made a mildly different modification. They were few and far between. An astounding accomplishment. I burned this onto a dual-layer DVD for a friend and told him, "Watch this. This is NOT the prequel(s) that you remember. You'll enjoy this." And that is the essence of a perfect Star Wars prequel fan edit. I really enjoyed this edit. The editor managed to keep the same movie in essence, in fact no relevant plot points has been left out, but the movie improved in many ways. Now it really feels as the old trilogy movies. In a way I feel this edit is what Lucas intended, but he could not do because he is lost in his new CGI toys he could not have at the time of the originals. I see the theatrical release of Ep. I long ago, so some comparison might be off. The obvious improvement of this movie is from the characters, as in the old trilogy, the characters are nice, enjoyable, and somewhat feels credible in the alien universe they exist. Jar-Jar gained a lot since the theatrical version; he might appears a little clumsy or dim but he is still fairly normal and not the complete idiot we know. TM2YC changed his dialogs completely using new subtitles and giving him an alien speech, now Jar-Jar helps us understand the relation between Gungan and Naboo. He is the son of Rugor Nass, the leader of the Gungan, and really tries its best to help the characters. Besides being the prince it makes sense he becomes Senator with Amidala for the planet. I am impressed how few cuts there and there and new dialogs can improve a character and a movie. In the description we read "Padme and The Queen are one character," but in the movie it feels even better. The queen staying undercover as one of the maid still seems to happen as you see her in maid clothes and when asking for the Gungan alliance you see the decoy queen in the background. Even if it was not what the faneditor intended I really liked this "show, not tell" approach; because protecting the queen with a decoy makes sense and it is important for Episode II begin. But it makes no sense that a decoy sends the real queen to do a menial task like cleaning R2D2! Unfortunately since TM2YC wanted to remove the subplot I felt one scene as missing: the decoy asking the undercover queen what to do and she answers "No have no fear" in the begin of the movie. Since it is not a mystery that the queen is in decoy (or she is not always in the regal clothes) Qui-Gon decision to go on Tatooine with the Queen and Prince makes more sense as he might want the support of powerful figures. In the original movie the reason to bring Jar-Jar was unphantomable. Moreover the Queen now is the strong politician we expect, not only a soldier as she appeared in the second half of the theatrical release. Obi-Wan and Qui-Gon Jinn were as in the original movie for what I recall, Qui-Gon improves more because the other characters make more sense. But Anakin improvement instead is impressive; the faneditor managed to make him to feel like a future Jedi. Many people seems annoyed by Anakin saying Ops or Whooooa and some fan editor remove those completely. 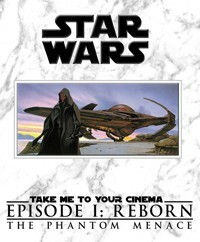 TM2YC instead kept two similar sounds in light-hearted situations: Anakin forgets to plug C3PO's eye (opss...), and Qui-Gon lifts Anakin to put him in the racing pod (wow!). That's it. I liked quite a bit because I felt that Anakin is still a child at heart (he is 9-10 years old after all! ), but when the situation becomes harsh he become completely absorbed and concentrated. This is evident during the pod race, there are various perils, but he solves, fixes, and wins without even grumble. Besides removing the dialogs that made him appears a bad racer has been removed and with the Watto partial faith in him Anakin appears as the great racer we expect. Also Qui-Gon appears less crazy in his plan. Cutting the water travel removed some terribly nonsensical elements from the theatrical release. It is not stated the army arrived in the other side of the planet and still manages to go faster than the Jedi passing through the center. It simply seem the two parts took a different way to reach the city; one underwater the other on the ground. Simpler and better. The blood test is cut in a great way: Qui-Gon sends the blood to Obi-Wan and asks for the results: Obi-Wan simple states they are out of the charts and ask what it could mean; Qui-Gon still is not sure. The feeling of scene is that in Star Wars is there some blood measurement that force aware people usually have high; but it is not definitive or mandatory. It if just another piece of the puzzle that is the mysterious boy. During the final battle Anakin goes to space willingly and he has more control of what is going on. Unfortunately the lack of good dialogs in the original movie make the part a little too silent. And in this case Qui-Gon feels weird at not saying anything seeing his wanted apprentice go to war. I am not sure it is possible, but possibly having Qui-Gon yelling to stay in the fighter shipcraft and Anakin disobeying and go to battle could feel better. The Obi-Wan victory in the final duel is completely changed. I think the original with Obi-Wan in serious difficult actually added tension, but the ending was badly executed. And so I liked more the TM2YC's lightning fast attacks of Obi-Wan that cuts in half the Sith. I recommend this edit! What the editor did with Jar Jar was brilliant. TM2YC plainly states that his intention for his PT edits was "to make good versions of these films that still felt like the same films in essence." 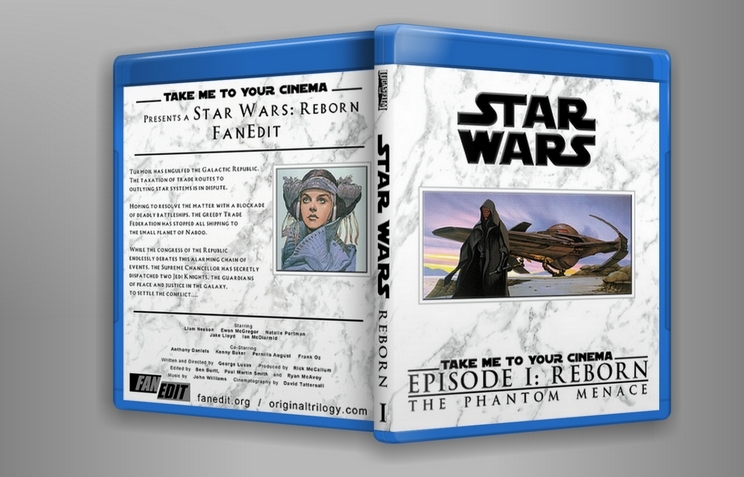 Furthermore, an important goal was to make "a true SW film [that] should give you around 2 solid hrs of entertainment." In some aspects, I feel he succeeded; in others, I believe the source material was just not there for him to achieve his goal. It is from this perspective from which I have chosen to review this edit, and thus while I do have some detailed criticism, I feel it mostly is due to the poor source material that failed the editor, as opposed to the editor failing the source material. This edit is presented in HD, with most of the deleted scenes included. For the most part, video quality was excellent; TM2YC did a fantastic job in upscaling and recoloring most of the deleted material; there were only a few places where I felt I could notice a difference in quality. But I was very impressed with his work in this area. The only noticeable non-HD part was actually the very beginning, where the edit used some non-HD introductory title card and fanfare material, I'm guessing to give the movie a throwback feel. For me it stood out a bit too much though. However, this is a minor point and quickly forgotten once the actual movie started. With regards to audio quality, it was fine (though surround sound would have been a nice addition). However, the only problem with the audio I noticed was during some of the deleted scenes -- in some cases, voices seemed to have a raised pitch, which implies to me that the frame rate for the deleted scenes didn't get properly converted to what the main movie's frame rate was. The most noticeable voice change to me was C3P0's during the morning of the pod race. The length of these moments were short though, and since the video quality was so good, I hesitate to mark the overall quality down any further than I already have. Generally speaking, I think the attempt to "remove" the presence of the Queen (when Padme was onscreen) led to the most noticeable problems for both audio and video. Finally, (and this is true of other fan edits so TM2YC is not alone in this), while I understand the desire to remove Anakin's line "Now this is Pod Racing!" as well as perhaps one of his celebratory cheers, this happens to be during the main star wars theme, and without fully re-scoring this section with replacement music, it becomes a very obvious edit point (and kind of hurts the powerful effect the full theme has at this climactic moment). While I understand and appreciate TM2YC's desire to create a "full length" Star Wars movie that is actually also a good movie, I believe the material is just not there to accomplish this satisfactorily without trying more radical approaches. There were some good changes done which I greatly appreciated -- Jar Jar's antics are for the most part removed. All of Anakin's yipees are gone, and only one "oops" remained, which I can live with. However, I unfortunately had problems with some of the other key narrative choices. The biggest problem for me was the attempt to remove the Queen/Padme ruse that was very much integrated into to the original storyline. While TM2YC did an admirable job in trying to make this work, I feel there just isn't enough source material to really explain this without being confusing to the audience. I do understand the desire to remove this seemingly silly plot line (though personally I don't have a problem with it), but I just haven't seen a way to do this without causing narrative damage (as well as noticeable editing issues, as mentioned previously). Seeing the Queen in her full costume and makeup, and then seeing Padme dressed as a peasant who talks and acts very differently, made it very difficult to really feel like they are the same person. The second narrative issue for me was the use of (or really non-use of) Jar-Jar. TM2YC made the decision to use subtitles for the Gungans, which should have freed him to make much more bold choices with regards to Jar-Jar and especially the visit to the Gungan City. However, beyond calling Jar-Jar a Prince and being Boss Nass's son, there really was nothing different about Jar-Jar, as most of his appearances were cut out anyway (with good reason of course, since most of his appearances after the underwater city are poor attempts at comedy). I think the biggest problem was having an extremely shortened visit to the Underwater City. The visit seemed to last less than a minute, and merely involved Jar-Jar asking the first person they meet for a submarine, which he gets because he is a Prince. Then they are off and away in the submarine. From a narrative perspective, I'm not sure what this sequence added, beyond a bit of length. I wonder...why use the pod race to fill up time when instead TM2YC could have tried to use the visit to the Underwater City, as he had already made the choice to subtitle the Gungans and thus could really change the plot line and truly make something out of Jar-Jar's character (and the Gungans) given the freedom the subtitles might have provided. The final problem I had with the narrative was the partial removal of the midichlorians. I say "partial" because the scene where Qui-Gon tests Anakin's blood is left fully intact, except for mentioning midichlorians by name. This ends up being a red herring at best, as Qui-Gon states he is checking for infections, and then Obi-Wan reports the "levels" (of something unnamed) are off the charts. I think the goal was to imply that the "something" is what makes Anakin turn to the dark side, but this is only implied by some musical cues that are part of the next scene, which and since they are part of the next scene, it is not clear whether the editor intended this musical cue to be meaningful for the prior scene or not. And there is no other mention of these levels or their meaning ever again. I really think it would have been better to either keep the midichlorians (yes, I know it's blasphemous, but is it really that much worse than the Virgin Birth?) or cut that part of the scene out completely. While I dislike the midichlorians, they do fit into the narrative of the original plot line. However, with all that being said, the narrative still works well in many other places, and the 23 minutes removed from this edit were minutes I certainly do not miss in the least bit! Enjoyment is obviously a purely subjective issue. While I really, really wanted to enjoy an edit of TPM that was of "full Star Wars" length (and this is really why I wanted to watch this edit -- to see if it could be done, and I was really rooting for it to be true), in the end, I cannot say I enjoyed this version as much as I wanted to. Beyond the aforementioned Narrative issues, I also personally do not care for the Virgin Birth, The Chosen One, and Palpatine-as-Sith-Lord being a bit too easy to figure out so early in the PT. I also felt that fiddling with the Queen/Padme plot kind of hurt the relationship building with Anakin. However, with all that being said, I do feel there are some very nice elements about this edit, and I greatly appreciate TM2YC's effort and skill in making this attempt to provide us a 2 hour version of Episode I. I am sure there are those who will enjoy this edit more than I have, and I'm glad for that. After all, like I said, this is a very subjective category, and you can't please everyone! NOTE - My enjoyment rating for the original release of Episode I is probably around a 4. So TM2YC's edit certainly is an improvement over the original, from my perspective! Overall, I think TM2YC did an admirable job, even if I found it to be a bit problematic in certain areas. Again, I want to stress that this is not the editor's fault, but rather a noble goal thwarted by the movie itself. And again, the movie itself, in my opinion, is just not very good, and it is difficult if not impossible to make an edit of this movie that can stand up along with the OT. Good Job, TM2YC, on your first edit, and I look forward to seeing future works by you, as you clearly have editing talent that will only get better with more experience! Thanks for the detailed feedback Seciors, must of taken you ages lol. Re the opening titles in SD. When I did these edits I was unaware that Harmy had done such an amazing job on these, otherwise I would have cut them in, rather than the GOUT source I used. Re the length. It was never my intention to make these edits 2 hours by padding them out (2 hours was always a secondary goal). My philosophy for appraoching these edits was improving character and enjoyment. Most other edits are focused on streamlining narrative. Just because something 'could be taken out' I wouldn't remove it, if I was enjoying the scene or it did something for our perception of the character. I've got 60% through a 30 minute edit of TPM just to prove this point to myself (And for comedy value). Even at 90/60 minutes there is a huge amount of redundancy in TPM, so removing it just for the sake of it seemed like a pointless goal. Re the podrace. I'm aware that perhaps a majority of people seem to find the Podrace boring. I'm not one of them. I think it is an absolutely thrilling experience from start to finish. It's only 15 minutes because there wasn't 20minutes of material lol. It's not that length to pad things out in any way. For me it was always the best bit in TPM and I just cannot understand how people are bored by it. Once again thanks for the feedback and please have a watch of parts 2 and 3.